Cleansing is one of the many reasons that Isagenix systems are different from other “diets”. In fact, diet is really the wrong word to use to describe Isagenix. We offer a collection of systems that can be customized to your own health goals and adopted as a lifestyle, meaning these are habits and tools you’ll have for the long haul. Cleansing is one of those habits within an Isagenix lifestyle. 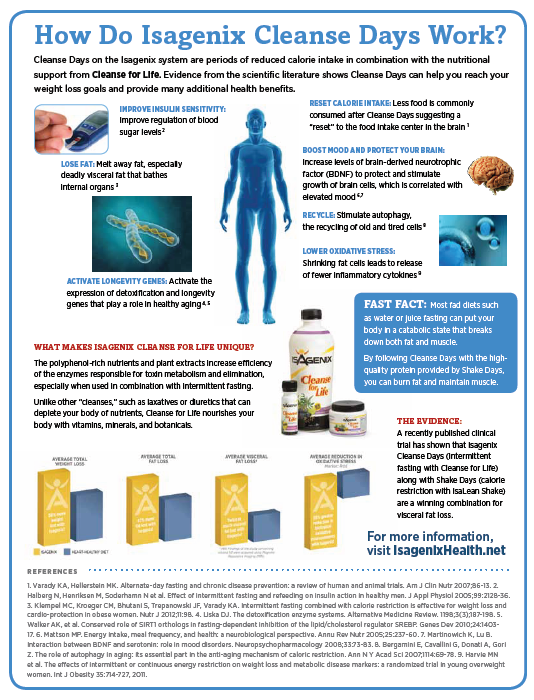 Isagenix has been leading the way to health by advocating the practice of cleansing for more than a decade. Now, recent scientific findings are leading nutritional researchers to believe that this practice of “cleansing”—a combination of intermittent fasting with herbs and vitamins that support detoxification—provides surprising health benefits. One of the first things that people notice when they embark on Cleanse Days is the weight loss. Studies on intermittent fasting have shown that it is just as an effective approach for weight loss as compared to cutting calories. In one study, overweight women who fasted intermittently for six months lost more weight than women who restricted their calories each day. It would seem that after a day of not eating, one would be more likely to gorge on food when it was re-introduced. Not so. Evidence suggests that when intermittent fasting becomes a habit, less food is commonly eaten during normal calorie days. Some theories imply that this could be due to shrinking of the stomach on fast days so that you are less likely to overindulge at meal time. Along the same concept, Isagenix cleansers proclaim that Cleanse Days practically erase any previous food cravings they used to have. Insulin sensitivity—how well insulin does its job of ushering glucose in the blood (after eating food) into the appropriate body tissues where it is used for energy—also looks to be “reset” by fasting. One study showed that healthy men who fasted for 20 hours every other day for 15 days had increased rates of glucose uptake, signifying improved insulin sensitivity and better blood sugar control (4). Research on fasting’s effect on brain and mood has so far been done on animals, but the results are still promising. It appears that fasting stimulates the production of brain-derived neurotrophic factor (BDNF), which increases the resistance of brain neurons to degeneration and preserves learning and memory. Fasting has also shown to be beneficial in the brain for stimulating growth of new brain neurons, called neurogenesis. When levels of BDNF increase, so do levels of serotonin, otherwise known as the “feel good” neurotransmitter . This could help explain why one study among aging men found that after two-day fasts, their moods and perceptions of quality of life were improved . One of the most important defense mechanisms the body has to guard itself against aging is a process called autophagy. Autophagy can be thought of as the body doing its own internal “housekeeping” so that all organ systems and processes continue to run smoothly. Old, damaged cell components are repaired or discarded so that cells can continue to function optimally. Autophagy in the body decreases as we age, so the body’s ability to self-help itself is reduced as well. Calorie restriction, including fasting, has been found to promote autophagy to repair the body’s cells. It’s as if the consumption of fewer calories allows the body to rest and to go into repair mode. This has been proposed to be the reason why calorie restriction and fasting have an “anti-aging” effect. Lastly, there is the detoxification that can take place on Cleanse Days. Often misunderstood, improved detoxification (or the increased efficiency of phase 1, 2, and 3 enzyme systems) while on Cleanse Days may be one of the most fascinating parts of the scientific story behind Cleanse Days. Nutritional support in the form of antioxidant vitamins and botanicals is essential in the detoxification process because some toxins are produced as the result of free radical activity. Additionally, nutritional support is needed to counteract the oxidative damage caused by toxins. Isagenix Cleanse Days do more than just help you lose weight. As science has shown, cleansing benefits aspects of the entire body, helping it to repair, reset, and restore. By including Isagenix Cleanse Days in your lifestyle, you are committing to living healthier and for longer. What Sets Isagenix Cleanse Days Apart From Other Cleanses? What Happens To Body Fat When You Cleanse?